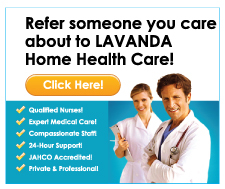 Welcome to Lavanda Home Health Care Agency! Located in Burbank, California, Lavanda Home Health Care Agency, Inc. has been serving patients at home within the Los Angeles and San Fernando Valley areas. We offer an array of services for those patients in need of personal medical attention within their home, particularly after being hospitalized for surgeries and/ or other illnesses. Lavanda Home Health Care Agency, Inc. offers an array of comprehensive services and specialty programs that make a vital difference to health care providers looking for follow-up care and case management of their clients. Lavanda Home Health Care Agency, Inc. is dedicated to providing innovative, quality, and cost effective home health services to patients in their homes involving families that require skilled nursing, rehabilitative and support services. Our Professional staff will work with you, your physician, and family to develop a plan of treatment.